A short walk on the Main Divide of the Southern Alps, offering alpine flora and panoramic views. The meandering boardwalks of Dobson Nature Walk • By Matthew. This short walk explores the rich herbfield on the saddle of Arthur's Pass, and offers panoramic alpine views. Visit between October and December for alpine blooms, including the grand New Zealand giant buttercup. From the Temple Basin Skifield car park, head uphill past ribbonwoods and hebes to a road crossing. 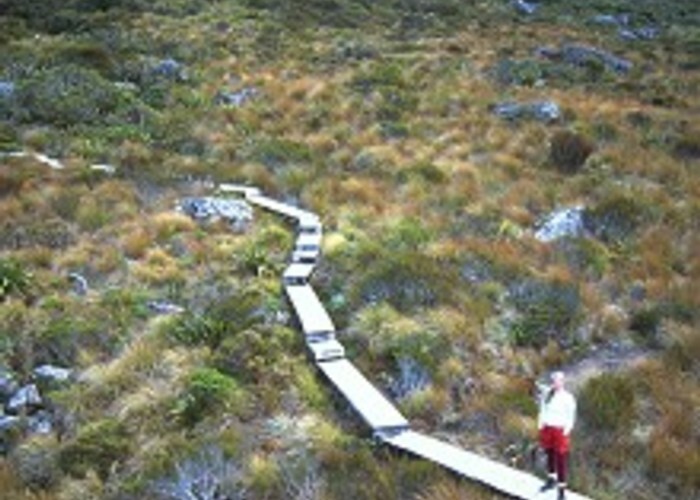 A boardwalk passes the end of the Arthur's Pass Walking Track to wind through the alpine garden, which is punctuated with massive boulders tumbled from the tops above.​ The wisp of the Ribbon Falls is visible in the distance on the right. The track climbs onto the hillside and drops back toward the saddle. From here, the Lake Misery Track leads onward to the Otira Valley, or return the way you came. Next to the road by the saddle, a tall cairn memorialises Arthur Dudley Dobson, the explorer who discovered the pass (already known to Māori as part of a pounamu trade route). This track connects with the Arthur's Pass Walking Track, the Lake Misery Track, and the Temple Basin Track, so you can extend your walk a number of ways. Added 1 June 2001 by MatthewMatthew. 4 revisions, most recently 27 March 2017 by MatthewMatthew.